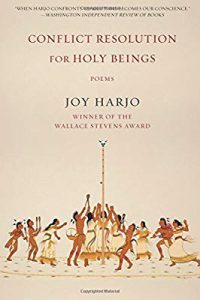 In celebration of Indigenous People’s Day (October 8, 2018), we are happy to present this interview with Joy Harjo. 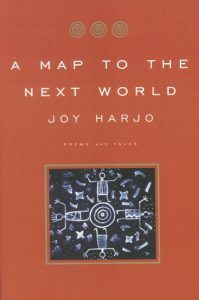 Joy Harjo was born in Tulsa, Oklahoma, and is a member of the Muscogee/Creek Nation. 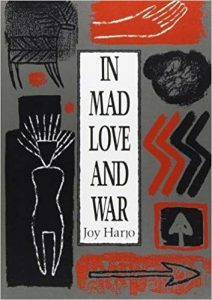 She is the author of thirteen books—including poetry collections, children’s literature, and memoir—for which she has received numerous awards including the 2002 Pen/Open Book for A Map to the Next World (W.W. Norton & Company, 2000), the 1991 William Carlos Williams Award for In Mad Love and War (Wesleyan, 1990), and her second American Book Award for her memoir, Crazy Brave (W. W. Norton & Company, 2013). She is also a renowned saxophonist and vocalist. The book that you’ve recently released, Conflict Resolution for Holy Beings—what number of books is this for you? I think it’s the eighth poetry book, but I have other books. I have a memoir, two children’s books, a collaborative book with an astronomer, and CDs and music. So that’s the eighth poetry book. 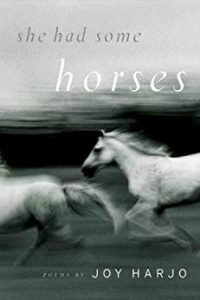 Do you find with each book you put them together a little bit differently, in how you approach the assembling in the order of the poems and . . .
Every one is different. It’s like children. [laughter] Yeah. Every one has its own story. Before the poems, you have these italicized sections in your books, and I was curious whether you wrote those after you put the poems in order, or if those were something that you already had that you worked in? I worked those in to fit, because I’m a horn player too, so they’re like sax riffs. And I think all literature is essentially oral. So it’s another way that I have of saying, “Okay. Here, let’s do a little riff here. And a little riff here.” [laughter] I think most of those I wrote after assembling the poems. I went to your reading this morning, which was just lovely, and I was going to ask if you found it very different to read to poets versus to an audience that was there for music. But you started out with a poem that was very much a song, and I thought it’s kind of both. But do you approach different audiences differently, the poetry audience and the music audience? I don’t know. I do what I do. I started playing horn when I was almost . . . when I was thirty. And I had been doing poetry for some time, and I already had a name in poetry, and I started adding music. And I thought, All of my poetry audience will come over to the music. But it’s not so. A lot of the poets say, “Well, we just want the poetry, straight. We don’t want anything with it.” And I have a whole music audience who, even though I’m using the poems, they don’t know anything about the poetry. So you find it’s very separated. Two different audiences that don’t have a lot of crossover? Often, it is. I thought there would be a lot of crossover, and there’s some but not a lot. How does it feel different to be doing a spoken poem versus doing a song, and the feedback that you get from one group or the other? I think I’ve always seen poetry as a matter of voice because of the way I came to it through my mother writing songs. To me, it’s pretty much the same voice. That’s what I’ve come to. There’s a voice in my saxophone voice, and if you hear my horn voice, my singing voice, the speaking voice, the poetry voice, it’s the same voice. It just expresses itself in different ways. When you edit your work, do you read the pieces aloud to check for the sounds? Do you find you get good edits out of that, even if you wished . . . you had saved it for later? Yes, I do. You know how it is, you get so excited when you have a new poem and, then you want to read it, and I’ll have to tell myself, “Okay, just take some time with this.” Because you know, by now . . . if you don’t know by now, [laughter] then you should know by now that you’re going to be full of shame and horror the next day if you don’t let the poem have its time to settle. Have you had pieces that were published in, for instance, a literary magazine and then you put them in a book, and then you find yourself changing things prior to the publication of the second time or the third time? Yes. One of the poems in Conflict Resolution, “Everybody Has a Heartache,” was published in Poetry Magazine for a Split This Rock conference. And I said, “It’s not ready.” They really liked the poem, the editor of that little section really loved the poem. I said, “But I know it’s not there yet.” But they wanted it anyway, so I gave it to them. So it’s much revised in the book. And even in the title poem, “Conflict Resolution,” there’s a whole section I would totally rewrite or take out. 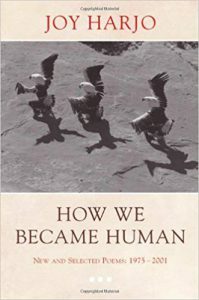 There was a lot of myth and cultural story woven into this book. And I taught history and English for many years, and as I was reading it, I kinda felt like I had done a disservice because of how little we talk about the stories of culture rather than just the history. Because it should be a part of history, and it’s often not. What do you feel is the importance of people’s individual stories? History is stories. It’s just what’s called history is usually the old. I think the feminists came up with it, history meaning “his story.” And yet, ultimately, history is the stories of everyone who was there, including the plants, including the animals, including the rooms things happen in. [laugh] It’s all part of the story. Do you find that where you are writing influences what you are writing? If you’re home or if you’re traveling, do you find you come to different kinds of subject matter? I’ve wondered about that. I remember when I moved to Hawaii for eleven years, and I had always wanted to be there, in the Pacific. I love the Pacific. But it was startling—even as much as I felt so at home and I loved the water and I got into outrigger canoe racing—that I had been so ingrained in the Southwest and Oklahoma where I’m from and that history. To move into another place was very difficult for my writing, at least for a while. A lot of the writing from that time . . . I don’t think is my best. Do you find that writing in the Southwest the landscape lends itself to being spare with words and conscious of every one? I don’t know if it did that, but when I started writing I was learning the Navajo language. And I loved that . . . New Mexico, I went there to go to Indian boarding school and came back home for a little bit, for about a year or two, and then went back. But the poetry, the spirit of the poetry came to me there. And it’s so much a part of me. I miss it so much. I’ll be in Tuscon next week. I’m excited about that. But I really miss the Southwest. It’s very much a part of my poetry, as is the story of my people. As is Hawaii, the water and the spirit of the water, who is one of my biggest teachers. So, places do affect me. I travel. I’ve always been a traveler. Even as a child when we didn’t go anywhere, books were my means of traveling, as well as walking and trying. They gave me that sense of discovery, discovery of new places. You’ve talked about the importance of paying attention to the sunset and what you can let go at that time period. Do you feel like in your travels, you have to make a conscious effort to be aware of time and the sun and what’s going on outside of, maybe, the rooms that you’re in, more so than when you’re home? Conflict Resolution for Human Beings includes this poem set in Vancouver about walkabout, and you had the dead umbrella and the broken wings. And as much as it’s hard to travel a lot, do you also find value in it, in that it brings you to pieces you might not have otherwise written? But, yes, there are also several poems in there about Hawaii, about Oklahoma. I get to travel quite frequently. So often when reading bios of you, they very much emphasize the history of and your role in Native literature in the US. Do you ever feel that it’s kind of a burden to be speaking, in some people’s minds, for a whole group of people as opposed to just for yourself? I can’t think about that because I know that I don’t speak for anybody else. I just follow that voice that was given to me to take care of. So I can’t even speak on behalf of my family. [laughter] You know how most families are? Everybody’s so different. But it’s true that I have often been, through the years, the token or the person that’s speaking on behalf of anyone that’s not your all-American male. [laughter] So it’s an impossible situation, an even bizarre situation sometimes. And there are many Native writers and many Native poets who also have a place. They have a place, though a lot of people aren’t going for, or they don’t wind up in a large of an arena. Their poetry or their songs are very important at home, and that’s what’s important. It’s not about being at a big-book thing. One of the first times I went back to the ceremonial ground, and they have a speaker that goes around, and I remember when he came by my camp, he says, “And you can leave your university books, all of that behind because this is not the place for them.” It’s a different world. There’s literature there, and there’s a place. A different system. Do you find that the people in your life have a great awareness of you as a poet? Do you find that they have an expectation of not being included in a poem or being included in a poem? I guess I don’t do a lot of using my poetry as a tool or wielding my poetry . . .
Not like a novelist or a . . . My memoir though, that was another story. But I don’t think they worry about it too much. And it was funny when I lived in Hawaii—people knew me as a canoe paddler, someone who paddled canoes, outrigger canoes, and they knew me. I remember going down to the Kapalama Post Office to mail out a box, and the woman looked at my name and she looked at me, and she says, “Oh, you’re the one that makes those really good cookies.” [laughter] So I thought, “Okay,” that’s what I was. People had no idea of my life as a poet. Do you find that when you were paddling, that that act of paddling, that the movement ever served to have words come to you that you would use later, that that was a meditative state? Or were you very much focused on just the paddling itself? It’s kind of all of that. When you’re involved in an act that can be very strenuous, there’s different ones when you’re racing and then when you’re practicing. I almost said rehearsing. And then when you’re doing this practicing, you’re focused. You’re really focused. But there is something about the rhythm. And so much does come to you, even as so much falls away. And being out there at sunset or at sunrise is just incredible. And moving in a rhythm. Do you ever get on the water at night, after dark? I have been, and it was kind of dangerous. We were out one time with the canoe club with our group, and we went way out and we got in trouble because we were out near the lane where the ships were coming in, got beeped at. So then we were paddling back and it got dark, and it’s kind of . . . It’s cool, but then you can hear the wave action where you have to come in. And you have to know where to come in, and so that gets a little . . . dangerous. Maybe like poetry. Danielle Kessinger has work published in Bartleby Snopes, the Drunken Odyssey, Baltimore Review, Burrow Press, and the anthology Jack’s Porch. 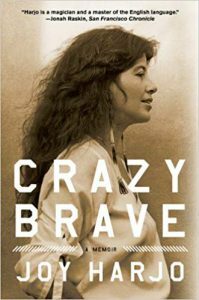 She has lived and written in the mountains of Colorado, North Carolina, Japan, Costa Rica, and Florida and currently resides in California. Photo of Joy Harjo on homepage by Karen Kuehn.